Casa Del Rio features water views and sunsets while overlooking 250' intersecting canals. This vacation rental is located on an over sized lot and is just around the corner from the river. Casa Del Rio features true Florida living with a unique rock waterfall heated pool, TV, pool bath & large under truss lanai. A custom gazebo built over the water with matching furniture is perfect to take in the sun (sets). The home lives like a great room while offering so many places to sit, relax & enjoy entertaining along the waterfront. A chef's kitchen is available featuring double ovens, large entertaining bar, stunning granite & lots of cabinet space. The family room has windows across the entire back of the home for breathtaking water views. The sliding glass doors in the main room, family room & master bedroom open to water views . The master bathroom is a must see, his & hers vanities- extra storage and a soaking tub. 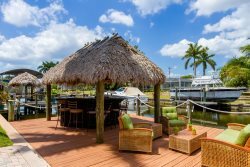 Casa Del Rio liegt in SE von Cape Coral, nur ein Strasse von dem Caloosahatchee River bietet diese Ferienvilla viel Ruhe und direkten, schnellen Zugang zum Gulf v. Mexico. Drei Schlafzimmer, 2.5 Baeder (eines davon dient als Pool Bad), grosses Wohnzimmer mit direktem Blick auf das grosse Boats Dock und den breiten Kanal. Die Kueche ist komplett ausgestattet und bietet viel Platz und "top of the line" Kuechengeraete fuer unsere Hobby Chef's. Der einmalige Poolbereich ist mit einem Wasserfall aus Stein sowie einer "Grotto" ausgestattet. Der Swimming Pool ist elektrisch beheizt. Wer sich nicht in der Pool Area aufhalten moechte hat die Moeglichkeit sich auf dem riessigen Dock aus zu toben und die Sonne zu geniessen oder sich unter dem grossen Tiki Hut ein kuehles Getraenk zu goennen. This property is awesome!! The outdoor space is beautiful and peaceful! Indoor is elegant and perfect! Bedding was super comfy and home was well equipped. Community is a bit sleepy, but theres much to do within 20 mins...Sanibel Island, Ft. Myers Beach, shopping. Love this area and this home is perfect! Well be back!! Thank you so much for a great stay! Bob was super responsive and helpful! We so appreciate everything!! Excellent house, no expense spared in decorating and custom features. Outstanding location for restaurants and beaches. We will be back for sure! What can I say, outstanding as always. The house was amazing!!! We have stayed in Vesteva houses before and prefer their houses. They are easy to work with and extremely responsive. The houses are always spotless and Bob is the best. We liked this house so much we booked it again for early next year. thank you Vesteva for a great experience. Thank you Vesteva for another great experience. Bob, special thanks to you for your friendliness and knowledge of the house! We have already booked our next trip in a Vesteva house!! We would recommend Vesteva Vacation Rentals to everyone. Everything was perfect and as written in the ad. Very quick to respond, helpful and honest. The house was clean, we loved the pool and the outdoors. The location was nice and quiet. Thank you Vesteva Vacation Rentals for making our stay at Cape Coral so memorable. Very easy process. Everyone was friendly! LOVED Casa Del Rio. It worked out perfectly for my relaxing girls trip. Would definitely love to stay there again in the future. This house is wonderful! It is beautifully decorated, very clean and relaxing and located in a quiet, peaceful area that is close to everything. It only took us about 15-20 minutes to get to Fort Myers Beach. Besides the Boathouse (our favorite) which is across the canal, its a short drive to other great restaurants and shopping. We spent most of our time out on the lanai watching the boats sail in and out of the marina. Although we were close to the marina and the Boathouse there was no noise from either. We were fortunate enough to see dolphins in the canal one day and the sunsets were incredible! Additionally our property manager (Bob) from Vesteva was awesome. He was very professional and very responsive and on top of everything. We will rent this home again! Thanks! We had another great stay at one of your homes. We just booked another vacation at a Vesteva Home in November. Looking forward to seeing you then! Our stay at Casa Del Rio was very nice. House was very nice and the neighbors were able to tell us some local places to go. Overall a great trip. Stay was real good. Thank you! !